Last week, Venla had what appeared at the time to be a seizure (she’s totally fine by the way, in case you’re worrying!). So, taking no chances, the daycare rang for an ambulance. It’s standard procedure for under-twos to be taken to hospital. Here are a few observations. At every step, we ran into nice people. It started with our paramedic who I loved, not just because his name is also Chris, but also because he too could make a passible career as a Ross Nobel impersonator. Everyone was good with kids and happy to see Venla. Now, you might think that was a given, given that we went to children’s A&E and then the children’s observation unit. But, when Elina gave birth to Venla, one of the pediatric consultants came around to check on her and he was completely flummoxed by her clothing fastening system, complaining he always got it wrong. Apparently, you can work with babies for your whole career and still not really know what to do. None of this this time. 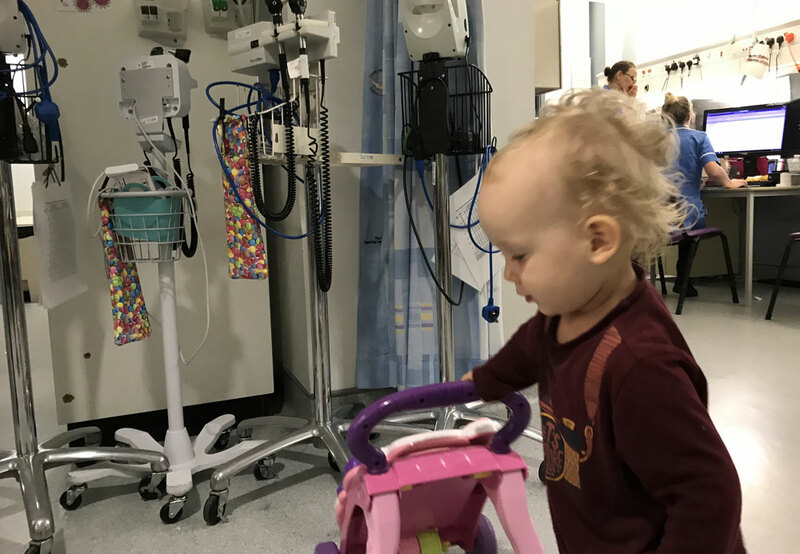 Venla was pretty unhappy at daycare and in the ambulance (constantly switching between crying and excited yelling “in a nee-naw!”) but once we got to hospital she quickly returned to her usual self. This was okay in the waiting room where they had toys and walls to contain her. But once we were in an examination room, or worse the ward of the CAT unit, she couldn’t care less about the toys. All she wanted to do was touch every expensive medal device and open every draw she could find. She could easily do this because many of the draws were placed at an excellent height for a toddler. Worse, many of them were open-sided to allow medical staff to grab items quickly in an emergency. It also allows toddlers to grab things. It occurs to me that hospitals are used to dealing with docile sick children who cuddle up with their parents. Or maybe who feel well enough to push some buttons or do a bit of colouring. But a curious child like Venla, who feels back to her full strength. That has trouble written all over it. After five hours of chasing her up and down hospital corridors and around hospital wards, we were both exhausted. At least it feels inefficient. Maybe it is there for a reason. But I was ill prepared for the whole process. When we got to daycare, the daycare staff were telling the paramedic what had happened. I assumed the paramedic would be taking notes and these notes would then be handed on to the rest of the hospital staff. But we were asked to describe what had happened. Even though we weren’t there. When I was getting a brief summary from the paramedic and the daycare staff, I didn’t realise that I should have been taking notes because I was going to be tested on it later. But apparently, I was. First by the nurse in A&E, then the A&E doctor, then the A&E nursery nurse, then the CAT unit nurse, then the CAT unit doctor. Even though neither of us had witnessed it. Why the notes weren’t simply handed over is unclear. It was nice to be left with a bill of £0, which would have been tens of euros in Finland, or tens of thousands in the United States. Which, for a Friday night out as a family, seems like a cheap win. This entry was posted on Wednesday, August 8th, 2018 at 11:00 am and is filed under Family & Parenting. You can follow any responses to this entry through the RSS 2.0 feed. Both comments and pings are currently closed.